On this page, we show you how to post an finders fee or commission ad. To learn more about how we work and other details you can read on the Finders Fee Program for seller page. The goal is to find a buyer or buyers for you. It it not always an easy task but to Post an commission ad is easy and a good way to start. Just see the example below and use the category “commission deals” when you post your free ad. 1. Start to post an free ad. 2. Select the commission deals category. 3. Follow the example on the picture below. Your ad will go online at once and we will review it after to make sure all necessary details are there. by posting an ad/ads in the category commission deals and offer a finders fee or a commission, this deal is between you (seller) and the person who find a buyer (worker) for you. 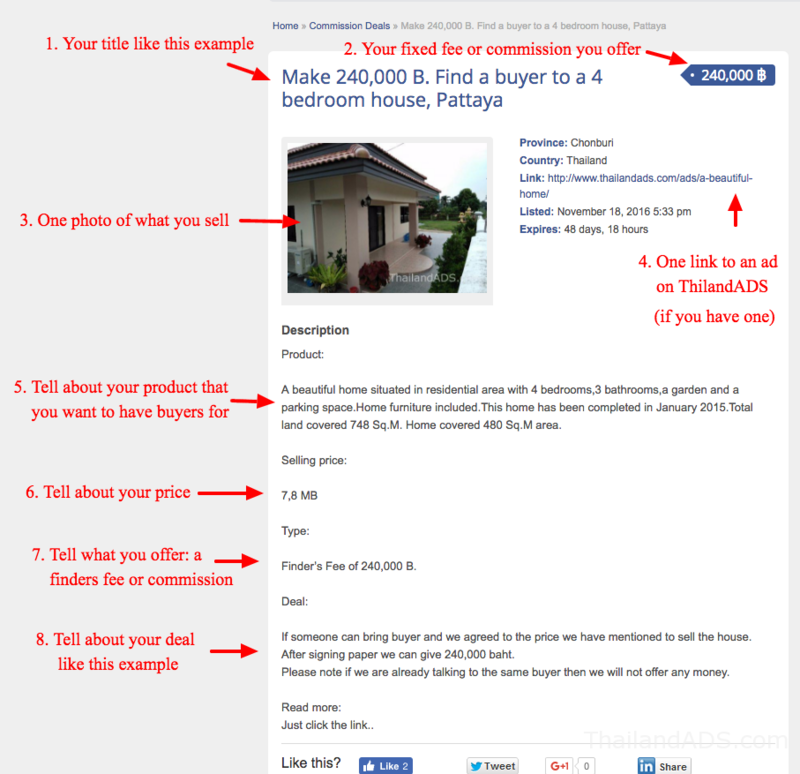 ThailandADS have no control or responsibility with which agreements the seller make. All agreed payments and benefits will be paid by the seller, not by ThailandADS.